In this article, we have designed a transistor based security alarm circuit with a high power siren that can be used to provide security for homes or as a warning for intruders trespassing. Only the basic design is provided in the circuit. You can check for advanced security alarm circuits using Arduino and Micro-controllers in the links given below. A complementary transistor pair (BC 557 & 337) is arranged as an oscillator, directly drives the speaker. Transistor Q1 (BC 557) is used to provide full charging of capacitor C2. When the push button switch P1 is pressed, capacitor C2 discharges through R8 and the circuit starts oscillating at a low frequency that increases slowly until a high frequency steady tone is reached and it is kept. When P1 is released C2 starts discharging and and output frequency slowly decreases. When C2 is charged fully the circuit stops oscillations. Please note that the pressing of the push button P1 denotes the cause of the siren alarm circuit to activate. This could be interpreted as the presence of a burglar or someone unwanted. Adjust the values of C2 & R6 to vary the tune. To get a better result for the security alarm circuit, it is highly recommended that you wire the circuit on a good quality PCB. A good quality common board may also do the trick. do you have the readily available PCB for high power police siren? What is the sound level in dB? Hi, I am looking for a high power alarm for my extruder low vacuum alarm. As long as SW1 is lcosed does this alarm repeat until the circuit is re-set? Also can i use something different then an 8 ohm speaker? What would i need to change to make it a 24 VDC circuit? wehn pus the button and hold on the bc337 very hot or melting ??? 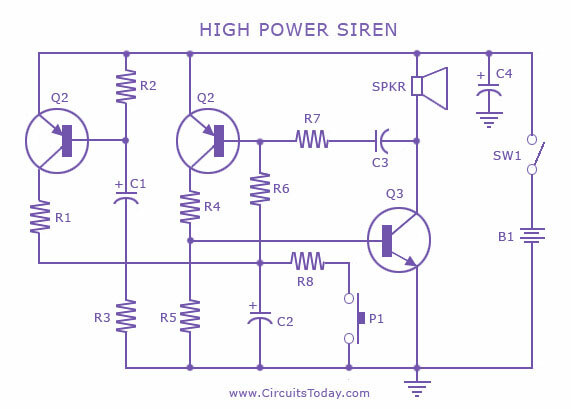 Do you have a diagram of super siren using a timer MB544?